Here's something interesting that turned up the other day in our inbox - an application by the University of New South Wales for a Scientific Research Permit that is up for public comment. A study of the foraging habits of a extinct animal? Should we be reading between the lines here? 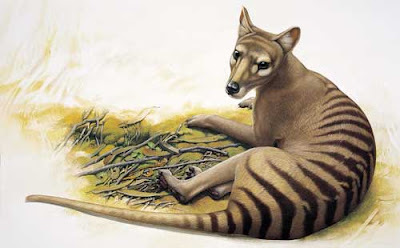 Aim of project: The aim of this study is to investigate the foraging behaviour of the extinct carnivorous marsupial, the thylacine (Thylacinus cynocephalus), which became extinct in Tasmania in 1936. This study will attempt to resolve the controversy concerning the type of prey consumed by this species. Stable isotope analysis on preserved thylacine and prey tissue will be used to determine the proportion of different prey types contributing to their diet. Why are we working on threatened species? The stable isotope ratio in the tissue of a consumer will reflect the stable isotope signature of prey that it consumed. We have collected tissue samples from preserved thylacine specimens in museum worldwide. In order to determine the thylacines' diet, we also need stable isotope values from fresh tissues of potential prey species (see species/taxon for list of species), including several threatened species. Conservation and management benefits: To restore native communities, it is essential to have an understanding of the historical food web. Investigating niche partitioning among Tasmania’s top predators prior to the establishment of exotic fauna will provide an important baseline to restore Australian habitats. This technique may also be applied to extant species to track long-term changes in individual diet, which may be important for conservation management plans. Benefits to our understanding of Tasmanian ecology or human health: This research will add vital information to the feeding ecology of the Tasmanian tiger and how it interacted with other species in the ecosystem. Maximum likely numbers of individuals involved: Tissues will be collected opportunistically from a maximum of 20 deceased individuals from each species. This will provide an adequate sample size for statistical analysis. Activities undertaken and methods: Different tissue types (e.g. muscle, skin, hair, whiskers, whole heads, bone and teeth) will be collected opportunistically from deceased animals, including road-kill from various locations in Tasmania. Samples are being collected by the project researchers and collaborators in Tasmania, including the University of Tasmania and the Save the Tasmanian Devil Program. The stable isotope signature of an animal can change with location, so it is essential that tissues are collected from wild animals in Tasmania. Fate of animals: All samples will be collected opportunistically from wild, deceased animals. No live animals will be used for this project. Likely impact on species involved (including any by-catch): There will be no impact on the species involved as we are only collecting opportunistic samples.